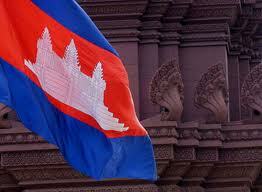 To say that Cambodia has had a troubled past would be a colossal understatement. However, even after everything the people here have been through, they are friendly, welcoming, and ready to share their experiences with the world in hopes that the rest of us may learn from history. 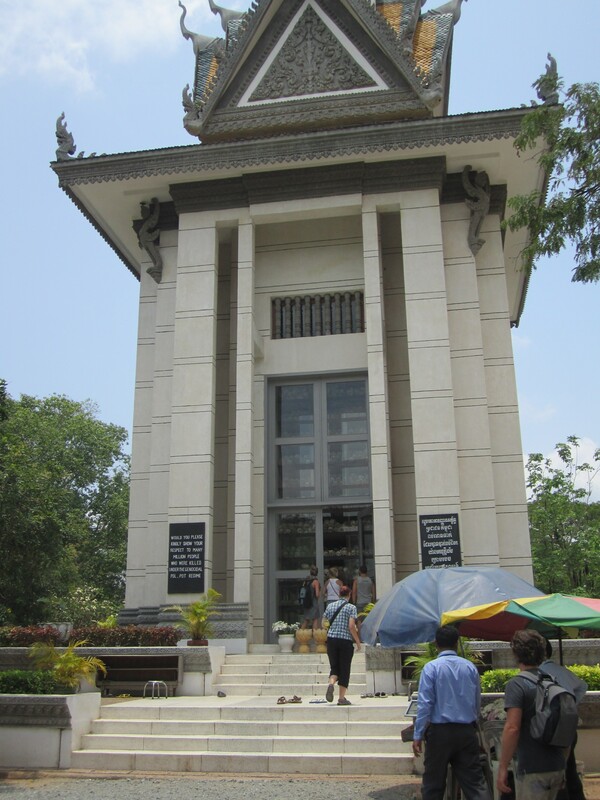 When I decided to visit Cambodia, I knew that I would not be able to leave without paying my respects to those lost in the 1970′s Khmer Rouge genocide. In 1975, the Khmer Rouge marched into Phnom Penh to the delight of the Cambodian people who believed that they were there to bring peace. However, within 3 days the city was forcefully emptied as the party began to put their vision of an agrarian society into place. The desire was to create a country of people who worked towards the betterment of the whole via farming, without questioning, without thought, without freedom of any kind. Anyone who had interacted with foreigners, anyone considered an intellectual, even those who simply wore glasses were seen as the enemy of this plan and were gathered for interrogation on suspicion of treason, spying for the CIA or the KGB. One of the interrogation centres was knows as S21. It was created from an abandoned school in Phnom Penh; once a centre of education, it was now being used to abolish all traces of education. 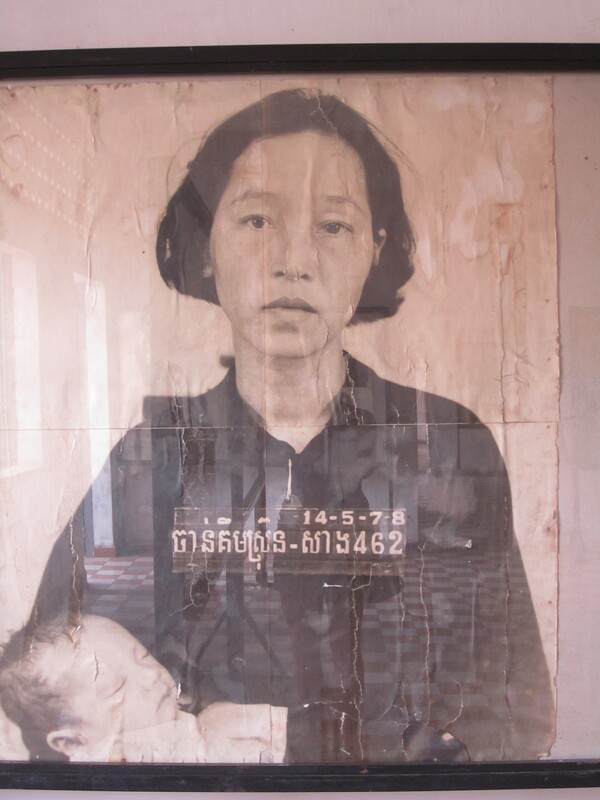 Officially known as Tuol Sleng, it was also known as “the place where people go but never come out”. This turned out to be brutally honest, as approximately 20,000 people passed into S21, and only 7 walked out. 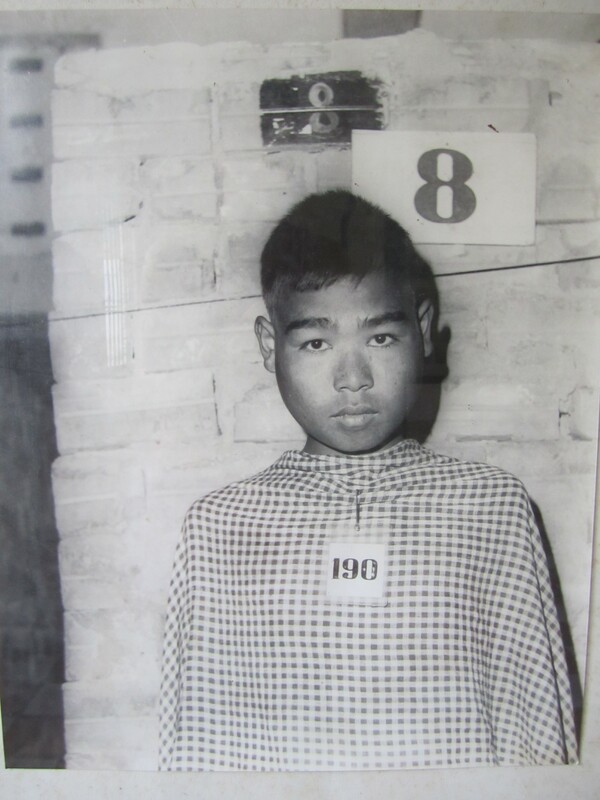 The life of a prisoner at Tuol Sleng began with mug shots and a single sheet describing the individual’s history and the charges against them. They were then interrogated until a confession could be achieved. The “interrogation” included techniques such as electric shock, starvation, water torture, beatings, and even being hung and spun to unconsciousness from the wooden structure once used for the school children s gymnastics (which still stands in the courtyard). Even just thinking about it now brings tears to my eyes. Once a confession, however dubious, was given, the prisoners would be transferred out of S21 blindfolded just after dusk to one of the nearby extermination facilities which would later be known as the killing fields. 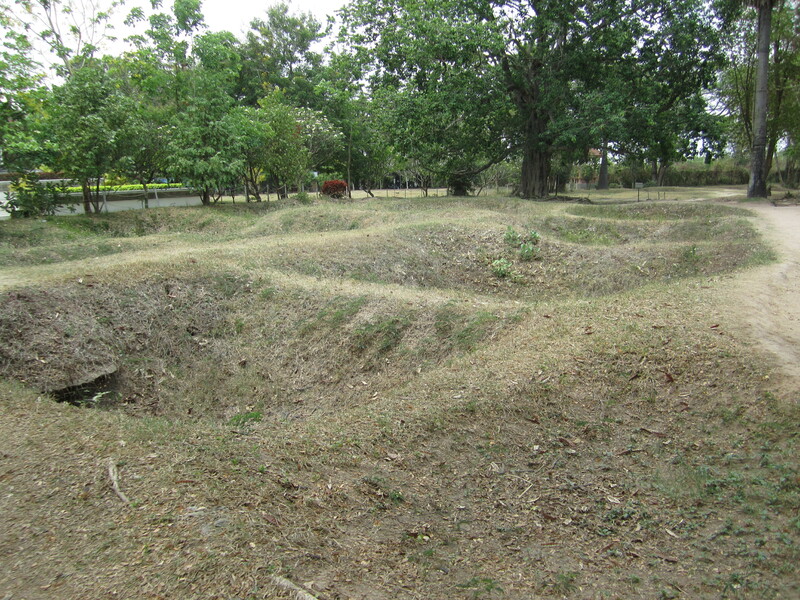 Just 17km from Phnom Penh was Choeung Ek, a former Chinese graveyard and orchard area. The prisoners would arrive in the dark, and if they survived getting off the truck they would be held in “the dark place”; a double boarded wooden pit under the guards house so dark that they couldn’t see each other. They would then sit in silence while waiting for their turn to be taken out to the pits and killed. It sometimes took until the early hours of the morning to kill the whole truck load of prisoners. Just beyond the sign was the school courtyard, which now houses 14 graves. These contain the bodies that were left when the staff quickly packed up the prison and fled the city. They were all beyond identification. We began to walk through the former classrooms. The first few that we entered contained a bed frame, an ammunition box that was used as a toilet and some other items such as leg shackles and truck axles (for beatings). On the walls were pictures of the rooms and the items in them as they were found when the prison was vacated. The images graphically showed the human remains sprawled out on the bed with blood everywhere, which caught me off guard. In the first room, I stood dumbfounded, feeling ill and unsure what to do next. So I continued on, throughout more and more rooms. The upper levels in the first building were mass cells, which meant that no walls had been built, but that the prisoners were shackled together in the crowded classrooms. The second building was where the prisoner id photos began. The rooms were willed with boards, all double sided, of the faces of the prisoners. 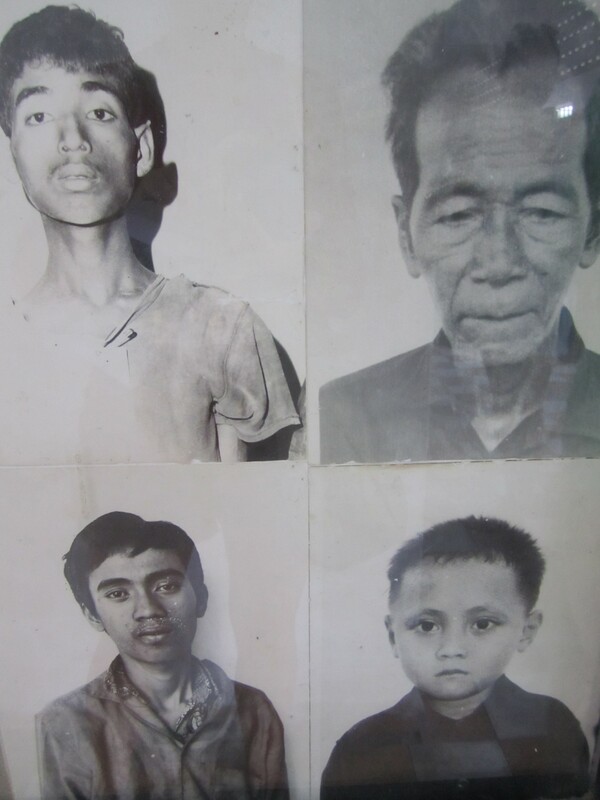 There were young and old, male and female, Cambodian and foreign, and many Khmer Rouge (the upper ranks became paranoid and began killing their troops as well). As I slowly made my way from room to room, through holes in the classroom walls, I began to feel increasingly unsteady and rather then pass out or be ill, I headed to the courtyard to sit for a few moments. I was completely overcome with the devastation of looking into the faces of those who’s grave I had just walked on. The feeling is not something I can even begin to describe. Cambodia lost approximately 1/4th of it’s population, 20,000 of which came through these doors. Once I had collected myself, I continued upstairs in the 3rd building. Here, the classroom had been converted into tiny cells, brick on the second floor and wood on the third. Some of the rooms still had the classroom chalk boards hanging on the walls next to the cells. 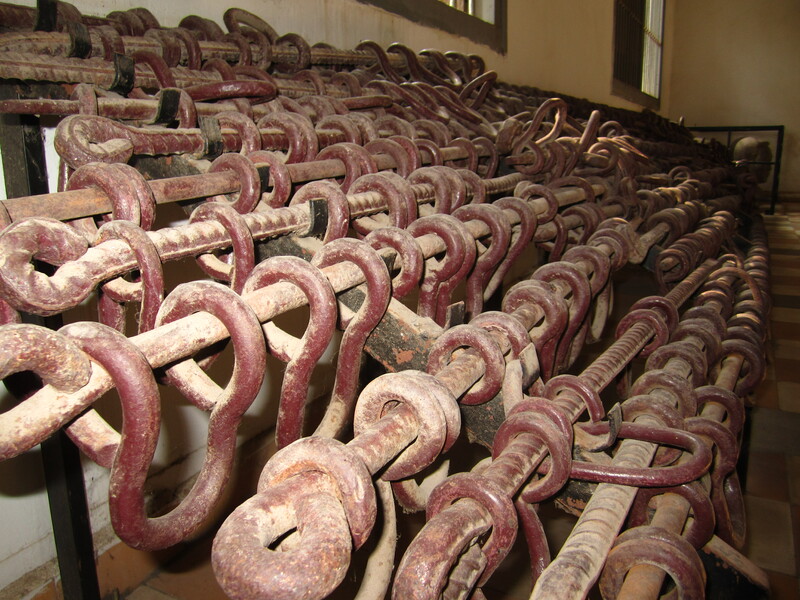 The open air hallways were covered with razor wire and there were shackles inside the cells. It was all too easy to imagine the people in these cells, starving, bleeding and dying. I couldn’t help but feel connected to these people as I was standing in the last “home” they knew. By the end of the day, I was exhausted and constantly on the verge of tears. This did not happen long ago. Written on the walls are messages from visitors, many simply saying “Never Again”. However, genocide has happened since and continues. It is astounding to know that we are part of a species that is capable of such horrific acts. I am at a loss as to how this can change, but I do believe that if more people were exposed to the awful truth of what has happened we may collectively learn from it. Currently, the top five living Khmer Rouge officials are facing trial for the crimes they have committed. Only one has acknowledged the Tuol Sleng Prison. For information on the trials, visit http://www.eccc.gov.kh/en . For a brief history of the Khmer Rouge visit http://www.history.com/topics/khmer-rouge . To see my pictures from these locations, visit my picasa album via the photos page on this blog. This entry was posted in Cambodia, Traveling. Bookmark the permalink. There are no words. Thank you Kerri. absolutely horrible!!! i do hope that is the worst you will see on your world travels. keep on posting good or bad. we’re learning more about our world through you. Thank you for sharing this Kerri. I found the video upsetting cant imagine being there. Thanks for sharing.